A few years ago I made pesto for the first time. Promptly after tasting it, I asked Jamey to please just go ahead and plant me a whole row of basil in the garden each year. Fresh basil is amazing and my kitchen never smells better than when I'm making pesto. Seriously- it's even better than the smell of brownies or chocolate chip cookies baking. If you don't believe me, you should try it. Did I tell you yet that I love pesto? I just want to be clear. Oh, and my daughter, Sadie? She asks to lick the spatula when I'm finished- raw, fresh garlic and all. That's my girl. I use the pesto recipe in Simply In Season. It can be found here. I usually times the recipe by seven and make that amount several times. We use pesto on pizza (with fresh or roasted tomatoes and mozzarella) or on pasta, in panini sandwiches or in dishes like Pumpkin Pasta. 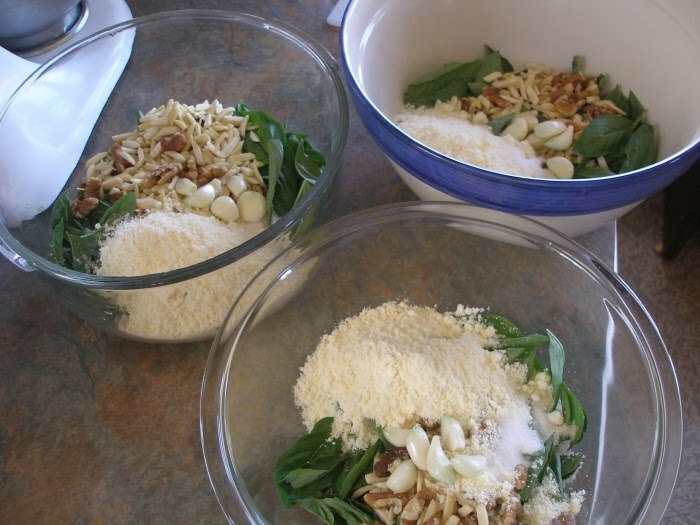 Some recipes suggest you should wait and add the parmesan cheese just before serving. I've always froze my pesto with the cheese already mixed in. It retains it's color and holds up beautifully, so I'm sticking with our current method. 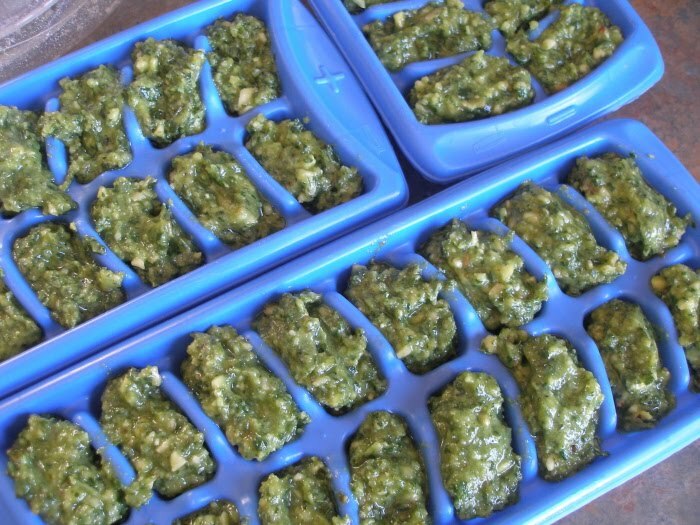 We freeze pesto two ways- in ice cube trays and in containers. The cubes are nice to have on hand when I only need a little bit of pesto. Fill the ice cube trays with pesto and freeze. Once hardened, pop them out into freezer bags and re-freeze. The larger containers work well when I need more. 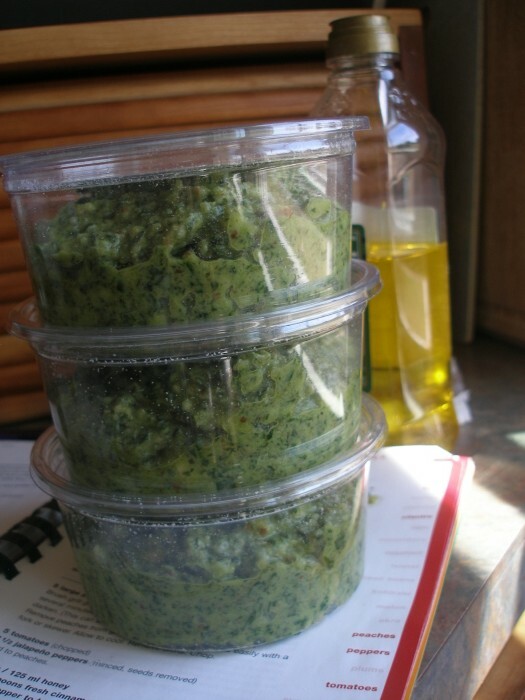 I freeze the pesto in the bulk parmesan containers- there's no need to wash them. Just be sure to let them thaw on their own, because those thin containers are not meant to be used in the microwave. My basil (not to mention the rest of the garden) is pathetic this year. Do you have extra to share? I'm convinced...definitely planting basil next year. I usually do...but didn't this year...as I don't use it fresh. But homemade pesto? What was I thinking not planting any?! JJ, I might. I'll let you know if I do. Michelle, Good plan- you'll be glad you did! I have never heard of Pesto or any thing about it, what do you do with it, thanks for sharing. 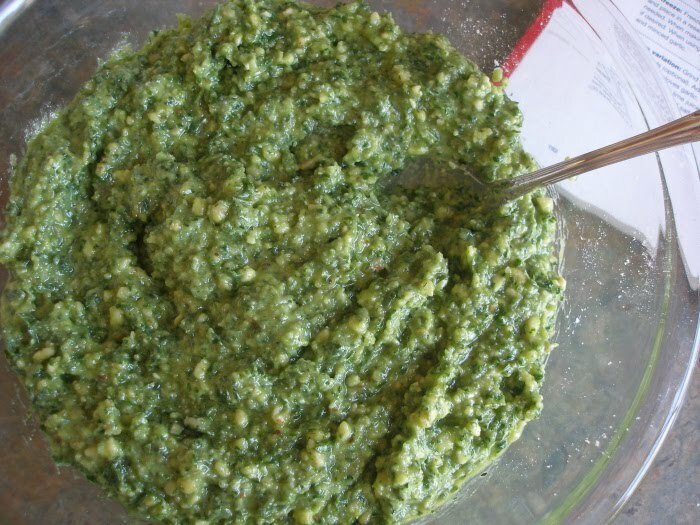 You can also make winter pesto with spinach. The same basic recipe, but you add a little dried basil to give it that pesto-y flavor. I believe you can also use parsley but I haven't tried that yet. I make the spinach version a lot around here. We don't have a garden (gone a lot in the summer) but I am always looking for a way to use up spare bits of spinach. Barbara, Pesto is an uncooked spread that is most often tossed with pasta. We like to spread it on pizza dough, top with fresh tomatoes and cheese and bake. It's also good in hot sandwiches. Check your grocery store- it's a tad expensive and that's why making it yourself is so fun:-). Mindi, Thanks for the alternative ideas. I've made it with Swiss chard before and it was pretty good. I've also heard of people making cilantro pesto, too. Mmmmmmm, you have my mouth watering yet again. I love the idea of freezing things in ice cube trays to use as smaller portions later on. This is one of your many recipes I will be making once I get back from vacation and don't have two kids to chase after for two weeks. You know I'll need something to pass my time while they are gone. Oh, My Goodness, we LOVE pesto around here! All but my son. But he's quite the picky eater, so no surprise there. My 4yo daughter also loves to lick the spatula - I think we should get our girls together some time! I currently have . . . 8 pots of basil on my deck and three plants in the garden. I have made pesto three times this summer so far and I think mid-next week will be time for #4! We freeze it in ice-cube trays, too, and use it through the winter. I was SOOOOO disappointed last year that we didn't have enough to last past January - had to buy some at the store. The price is painful, and it's not even all that good . . .
We feel the same about pesto and my children are especially crazy about it! But my husband's row of basil isn't doing well - boooooo. I'm definitely going to buy some. One of the things I LOVE about frozen pesto cubes is that you can put one in a bowl, dump hot pasta over it, and hey presto, dinner is ready. I've always frozen mine with the parmesan in it too. 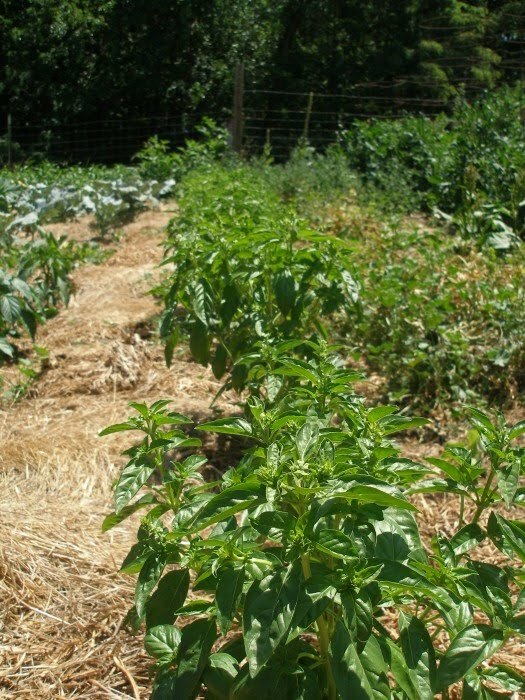 Did you know the only 2 things we have actually growing well in our 'new' garden is basil & tomatoes. I insist on the basil for the same reason. mmmm. great picts. um. going to. get. my mixer out! Thanks for the inspiration! I just happened upon your blog today after doing some blog hopping and let me say Yum!!!! I too love Pesto and I love the idea of freezing it in ice cubes. Why didn't I think of that. I freeze fresh lemon juice that way when we have lemons on the tree. I doubled the amount of basil I planted this year just so I would have enough to make pesto to share. My neighbor brought me a basil plant to put in my garden to use just to make pesto for her! Love it around here and I am always sad to see the last of it leave my freezer in the winter. My basil is just now coming up and I have the cookbook. I hope I can put away some pesto, too! I'm so glad you suggested it because I really wasn't sure what I'd do with it. Now I know!